It seems the world of pocket-camcorders is ever growing, make space for the DV1. 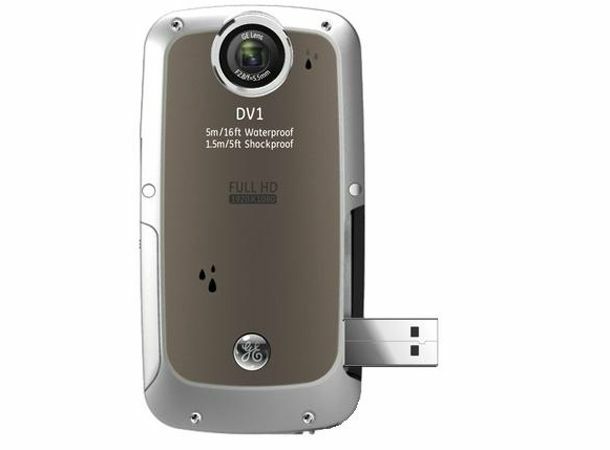 GE has unveiled the DV1 Pocket Camcorder which it hopes will leave the competitors eating its dust. This metaphor is actually quite appropriate considering it's shockproof, dustproof and waterproof making it a truly adventure-orientated piece of kit. Throw in a 5MP CMOS sensor and full 1080p video recording and you've got some impressive specs for your mountain shots. It'll record to SD or SDHC up to 32GB and comes with a generously sized 2.5inch LCD screen to review all your Indiana Jones style handiwork. As if that wasn't enough, you'll get a flip-out USB port and HDMI output so when you've cleared the mud and debris away you can plug it in and show everyone at home. Of course this is all speculation, you don't have to visit the Alps, or the snowy wastes of Russia as it'll still be just as good at recording our gentler shores. It comes out in October and while theres no word on price you can expect it to be priced competitively against rivals like the Sanyo Xacti or the Sony Bloggie Touch.